Well, that’ll wake you up good and proper. Wednesday is bin day here at Cooper Towers. When I opened the bedroom curtains this morning, I noticed that my beloved spouse, when he left for work at oh-my-god-o’clock, had neglected to put the blue recyclables bin out for collection. Not to worry, I thought; I’ll put it out after breakfast. Except by the time I got down the stairs, I could hear the bin lorry in the next street. Oh noes! So out I trot, barefoot but otherwise dressed, opened the gate and trundled this big 240-litre wheelie bin out to the path. 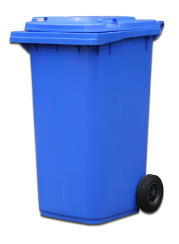 Since wheelie bins are not the nimblest-handling things, I managed to trundle it over my left foot in the process. More precisely, over my toes. And the bin was full.